During last Sunday’s Washington Redskins 27-20 win over the Los Angeles Rams, Redskins wide receiver Terrelle Pryor caught just two passes for a total of 31 yards. After he caught his last reception of the game, he was tackled by Rams safety Cody Davis. He was tackled very low by Davis. 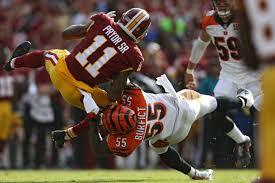 Low hits on an unprotected receiver have become problematic since the league made it illegal hitting receivers high. An example was in preseason, when Giants star Odell Beckham Jr., who was injured and out for close to a month until Monday’s game against Detroit and he still did not look 100%, was tackled low. Of course, the problem is the NFL fines its players for hits that are close to the head, but low hits are becoming a big issue as well. Washington safety D.J. Swearinger hit Dustin Keller a tight end with the Dolphins with a low hit in 2013 when the safety played for Houston. The hit it turned out ended the career of Keller. Swearinger defended himself by saying with rules the way they are today, you need to hit receivers low. If he would have hit Keller high, he would have been fined. In January of 2012, James Harrison a linebacker for the Pittsburgh Steelers hit Eric Decker, a former wide out with the Denver Broncos and now with the Jets, low in a wildcard game between the AFC rivals. Decker was injured during that play but general manager of the Broncos John Elway conceded that the tackle by Harrison had been within the rules given the emphasis the NFL has on lowering head in injuries. The target for tackling is lower in today’s game said Elway five years ago. He added that Harrison, because he has received a number of fines, did not have another option other than hit Decker low. Elway added that he did not believe Harrison intended to hurt Decker, but obviously due to the situations he has been involved with, he was required to tackle low and be as far from the head as possible, with the result being a sprain of the MCL for Decker. Returning to Pryor, he was lucky and avoided injury Sunday, but wanted to make sure that the Rams safety knew that he knew that type of tackling was frowned upon by Pryor and other NFL receivers. The NFL must come up with a solution or serious injuries to the lower extremities of players will increase.